On this day in 1934 Carl Edward Sagan was born in Brooklyn, NY. Sagan was an American astronomer, cosmologist, astrophysicist, astrobiologist, and popular science writer and communicator. He has published over 600 scientific papers and authored, co-authored or edited more than 20 books. He also co-wrote and narrated the award winning 1980 television series Cosmos: A Personal Voyage. From 1960 to 1962 Sagan was a Miller Fellow at the University of California, Berkeley. In 1961 he published a paper in Science on the atmosphere of Venus. From 1963 to 1968 Sagan was a researcher and lecturer at Harvard, before spending the next 30 years of his career as a faculty member and Professor of Astronomy at Cornell. Sagan was also an advisor to NASA, where one of his duties included briefing the Apollo astronauts before their flights to the Moon. Sagan put the first message into space too; attached to the space probe Pioneer 10, launched in 1972 and the first spacecraft to leave our solar system carrying a message to other worlds. 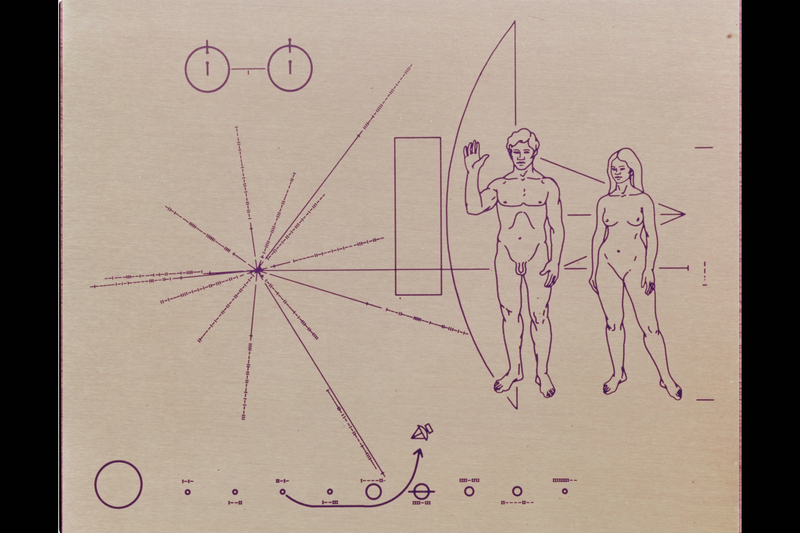 The plaque, and first message into space, designed by Dr Carl Sagan and Dr Frank Drake. The artwork was prepared by Linda Salzman Sagan. Image courtesy of NASA. This image is from a collection of photographs taken at Ames Research Centre during the Jupiter encounter periods in December 1973 and December 1974; a memento of the highly successful Pioneer 10 and 11 missions to Jupiter. Courtesy of NASA and Joseph and Donna Roizen Telegen (Pioneer 10 and 11 Missions Jupiter encounters).